On the very day of Hadrian's funeral, December 26, 795, the pious priest Leo was unanimously elected to succeed him. Leo, from a family of ordinary folks, had been a cleric from his youth. He had risen to be cardinal-priest of Santa Susanna and a high papal official. He was a kind, charitable, and devoted ecclesiastic. The new Pope lost no time showing Charlemagne that he intended to maintain friendly relations. It was well that he did so, for kind and amiable as he was, Leo was to be attacked in body and reputation. In 799 a conspiracy was hatched by Paschal the primicerius, a nephew of the late pope. While Leo was walking in the procession of the Greater Litanies on April 25, armed men scattered the procession and fell on the Pope. 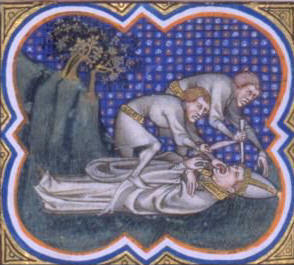 They threw the Pope down, hurriedly stabbed at his eyes and tore at his tongue. Then after leaving Leo lying all bloody in the street, they came back, dragged him into St. Sylvester's Church and had another go at blinding him. Then they placed him in the monastery of St. Erasmus. Quite surprisingly, Leo recovered the use of eyes and tongue. His friends got him out of the monastery and Winichis, duke of Spoleto, took him under his protection. Leo went to Paderborn to get Charlemagne's aid. The great Frank received the Pope with honor and sympathy. He sent Leo back with officials to settle the matter. The Pope's entry into Rome was a triumph, for the conspiracy was not popular. Charlemagne himself came down to Rome in 800 and held a great assembly in St. Peter's. He wished to clear the Pope of serious accusations which the frantic conspirators brought against their victim. The bishops, of course, refused to try the Pope, but Leo willingly mounted the ambo in St. Peter's and solemnly swore that he was innocent of the charges. Charlemagne ordered the conspirators to be executed, but at the Pope's kind plea, commuted their sentence to exile. Two days later at the Christmas Mass, the Pope placed a jeweled crown on Charlemagne's head while St. Peter's rang with the glad shout. "To Charles, the most pious Augustus, crowned by God, to our great and peace-loving emperor, life and victory!" The empire in the West was restored. Leo hoped to see the new Emperor of the West marry Irene, the Eastern Empress, but the deposition of Irene in 802 ended the project. Leo got along well with Charlemagne, but after the Emperor died in 814, new troubles broke out in Rome. A fresh conspiracy was organized, but this time the Pope got wind of it in time and had the ringleaders seized and executed. Then the little lords of the Campagna banded together to march on Rome, but the duke of Spoleto dispersed them. Leo helped the monks of Constantinople who led by St. Theodore Studites, had been exiled for opposing imperial tyranny. From Charlemagne the Pope had received a large share of the treasure the Frank had captured from the Avars. Leo used his money as a just steward, to help the poor and to beautify churches. This busy Pope worked to build or restore 160 churches. Under Hadrian and Leo III the decay of Rome was checked. St. Leo III died in June 816. His feast is kept on June 12.